JUWON OSHANIWA will visit friends in London during the international break as his absence from the Nigeria squad continues. His last cap came almost a year ago and he isn’t included for this week’s friendlies against Democratic Republic of Congo and Cameroon. 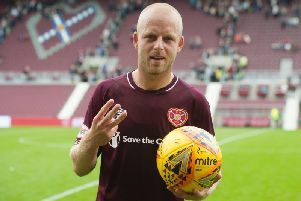 He is confident, however, that playing consistently at Hearts will earn him a recall. Oshaniwa waved club colleagues like Callum Paterson and Sam Nicholson off on international duty at the weekend knowing he would stay put. The 25-year-old is eager to add to his 17 caps but isn’t fretting about the situation. Nigerian Football Association officials have reassured him he is still on the radar of recently-appointed coach Sunday Oliseh. His last appearance in Super Eagles green came last November in a 2-2 draw with South Africa. Then-holders Nigeria failed to qualify for the Africa Cup of Nations that night. Oshaniwa, their World Cup left-back in Brazil just four months previously, is adamant his international career will continue. “I have won the Africa Cup of Nations for my country. I’ve played a lot of games in the biggest fiesta [the World Cup] so I’m not worried, I’m not bothered. I just keep doing what I’m doing,” said the player, who arrived at Tynecastle in August from the Israeli club FC Ashdod. “The most paramount is what happens here, where I work and where I earn my daily bread. I just put the national team out of my head. The glory and the achievements here are going to announce my being back to the national team. Oshaniwa speaks with great intensity regardless of topic. It is one of his most endearing traits, for he seems to be to be passionate about everything. Passionate about God, passionate about his career, passionate about Hearts, even passionate about being left out of his national team. He is asked if playing in Scotland can help his international prospects. “Of course. Even when I was still playing in the domestic league [in Nigeria], I’ve been a regular with other competitors like Taye Taiwo and Elderson Echiéjilé. They are big players. I’ve been working hard and doing what I do best. At no time have I been discouraged. I’m the kind of person who just keeps his head straight and lets the achievements and success announce my return. Hearts’ players have this weekend off as their next game is not until Sunday week at Dundee United. Oshaniwa admits it is a chance for those carrying minor knocks to recover. He intends heading to London to meet up with friends, with rest and recuperation a priority. “It’s a recuperation period for the players,” he said. “We have a had a lot of competitive games but, now we have an international break, at least some people will work on any deficiencies with their health. Those who have minor knocks can go through proper treatment and come out fresh for the next few games.